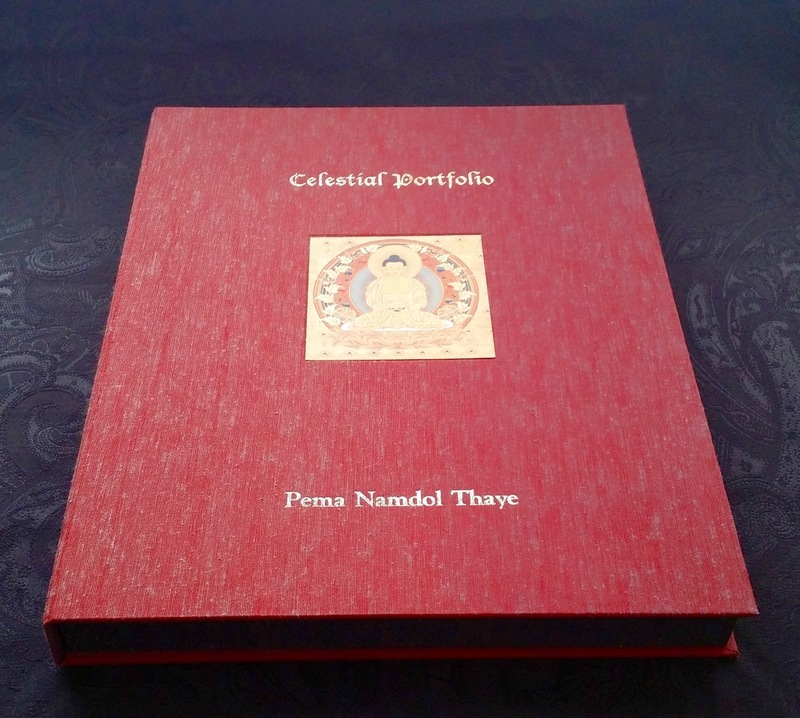 An elegant collector's item, Celestial Portfolio is an entirely handmade print box set by master artist Pema Namdol Thaye. 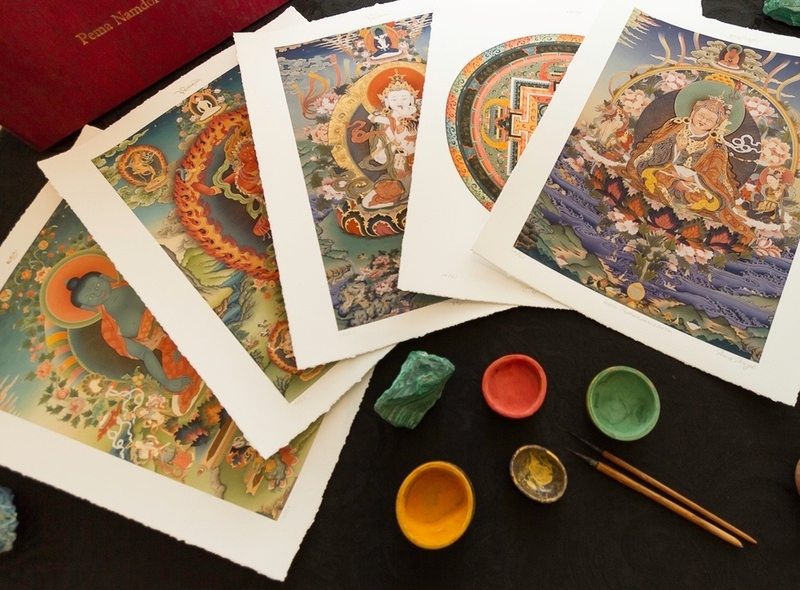 This unique fine art publication celebrates the pinnacle of the artist's finest traditional Tibetan thanka paintings spanning more than twenty-five years. Encased in a hand made silk box embossed with foil inlay, this limited edition print box set contains twenty-one fine art folios. 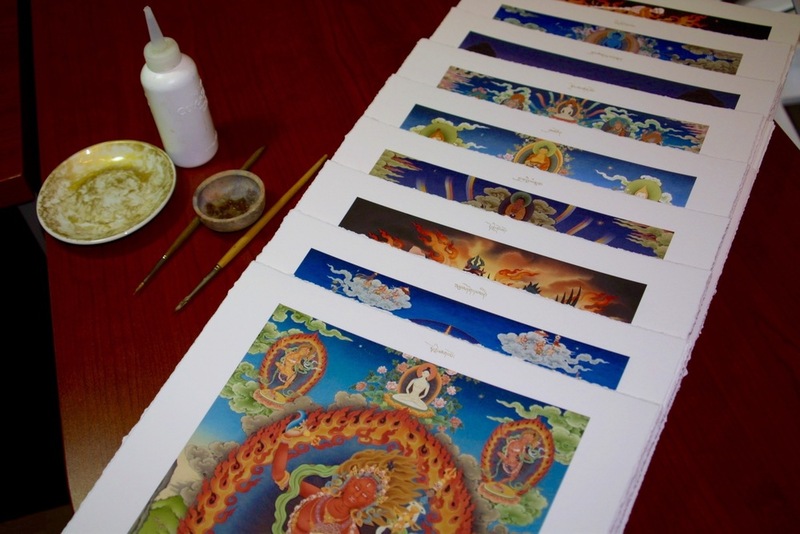 Each folio includes a 12"x15" giclée print reproduction of an original thanka painting by Pema Namdol and an accompanying descriptive text delicately bound by hand-cut Japanese rice paper. Celestial Portfolio is limited to only 108 copies. Every print, which can be accessed as an individual piece and framed if desired, is numbered and signed, with its title burnished with 24 kt gold by the artist. The dye-based reproductions are virtually indistinguishable from the original thankas, which were painted with natural hand-ground pigments and precious stones, using custom fine brushes - some with as few as eight hairs - to achieve vivid color and detailing; their completion took anywhere from three to twelve months. Subjects in the paintings include a broad range of Tibetan Vajrayana subjects inspired by history and legend, ranging from peaceful to wrathful figures, from historical saints and enlightened teachers to celestial buddhas and bodhisattvas. Celestial Portfolio includes a rare print of Dorje Drölo, Pema Namdol's highest quality painting only recently revealed to the public. Made entirely in the USA with the unsurpassable quality of giclée processing on fine art archival paper, this print box set comes with a personalized certificate of authenticity.